The Colorado DOT wanted to reduce the number of spans for this bridge while maintaining a shallow superstructure to preclude changes in grade. They determined that high-strength, precast adjacent box girders would provide the best solution for their needs. A combination of concrete with a compressive strength of 10,000 psi and 0.6 in. diameter prestressing strands was used. 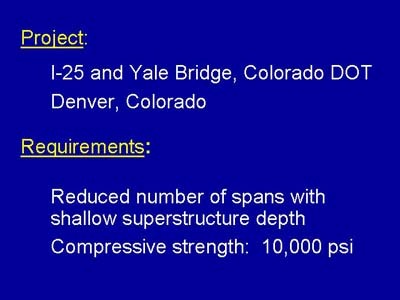 The two spans are 112 ft and 97 ft in length and the depth of the superstructure is 36 in. Leonard, Mark A., "I-25 Over Yale Avenue -- The Thin Solution," HPC Bridge Views, No. 3, May-June, 1999, p. 2.